So you may have read earlier this week about me reaching the one year anniversary of my blog. It was a fabulous milestone to reach as if Im honest, lack of time usually gets in the way of me carrying on with anything! I have just fallen so much in love with the whole blogging world, that I always try to find the time. Anyway, I wont keep bleating on, you can read the full blog-a-versary post here if you would like. I am truly, so humbled and honoured that you all take time to read my blog, comment, send lovely messages that I thought I would do a little giveaway. 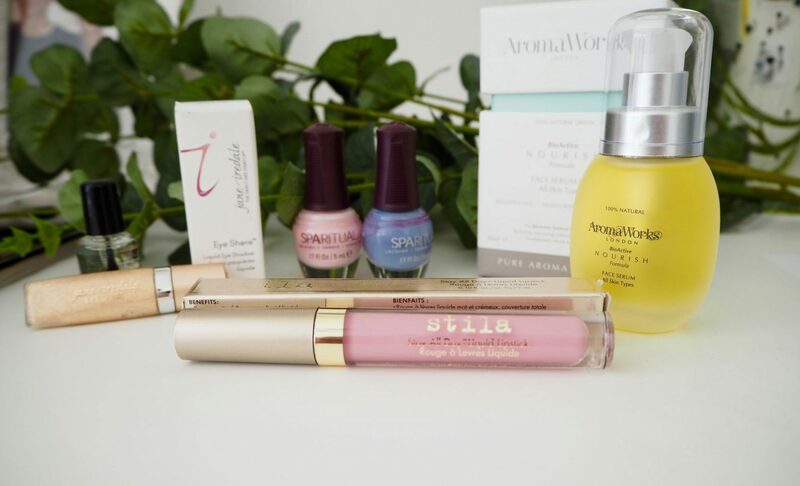 I have put a selection of goodies from some of my favourites together, including a beautiful Stilla Longlasting liquid lip colour, and a beautifully hydrating and nourishing facial oil from the Aromaworks range. This literally makes your skin feel like velvet and is a great treatment type serum. Anyway, to enter, you simply need to click the link below, follow me on twitter or facebook (if you dont already) and follow the instructions. "My blogs 1st birthday – This wonderful discovery"
Yay so exciting! Happy blogaversary!